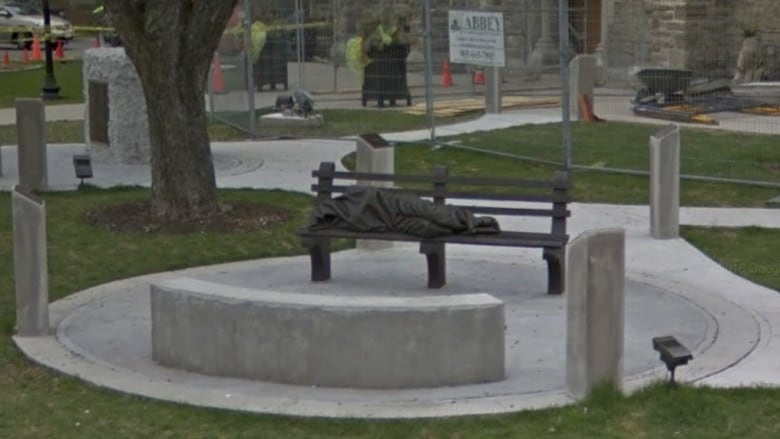 Hamilton's 'Homeless Jesus' statue in front of St. Patrick's Church stopped, police say, a runaway junk removal truck from crashing into pedestrians. A Homeless Jesus statue in front of St. Patrick's Church in Hamilton stopped, police say, a runaway junk removal truck from crashing into pedestrians. The truck was rolling down the Claremont Access on Victoria Avenue, according to police, when the driver realized he wouldn't be able to stop in time for a red light at King Street East. He veered east and hopped the curb outside the church to avoid hitting other vehicles or pedestrians. Instead, the truck smashed into the statue, which depicts Jesus wrapped in a blanket, his pierced feet the only indication of his identity. If the statue hadn't been there, wrote Const. Jerome Stewart in a media release, the truck would have continued into oncoming traffic and could have struck pedestrians. The church shared a photo of the smashed artwork on its Twitter feed, promising the statue will be resurrected soon. There are several casts of the statue around the world, but the controversial artwork has also been turned down as an installation at several churches. Ontario artist Tim Schmalz said created it after being inspired by a homeless man in Toronto. The life-sized bronze figure has been mistaken for a real person in the past, resulting in several calls to the Hamilton Paramedic Service with concerns of a homeless person sleeping out in the snow. Homeless Jesus has also visited the Vatican where Pope Francis prayed with it and blessed it in St. Peter's Square.